Although the season I so love is over, and I have-- with regret-- accepted that-- I am still here. 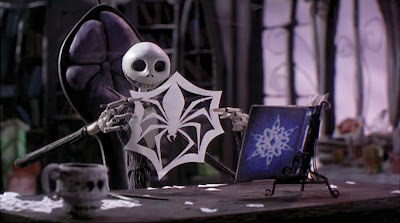 I have to admit, with all these jingling bells, snowflakes, red-suited men and reindeer, I feel terribly out of place, such as our friend Mr. Jack Skellington here. Over what I am sure will be a long, blustery, white, cold, dark winter, I will be writing more. Now that autumn has come to a close, I will have time to finally write of my trip to Salem, Massachusetts, this past fall, and my own personal season of the witch. And absolutely, I will-- while Christmas and snow rages outside-- find some time for some scary ghost stories. And share them here. A happy, wintry haunting to you all. Image: Disney's "The Nightmare Before Christmas"